Happy St. Patricks Day! 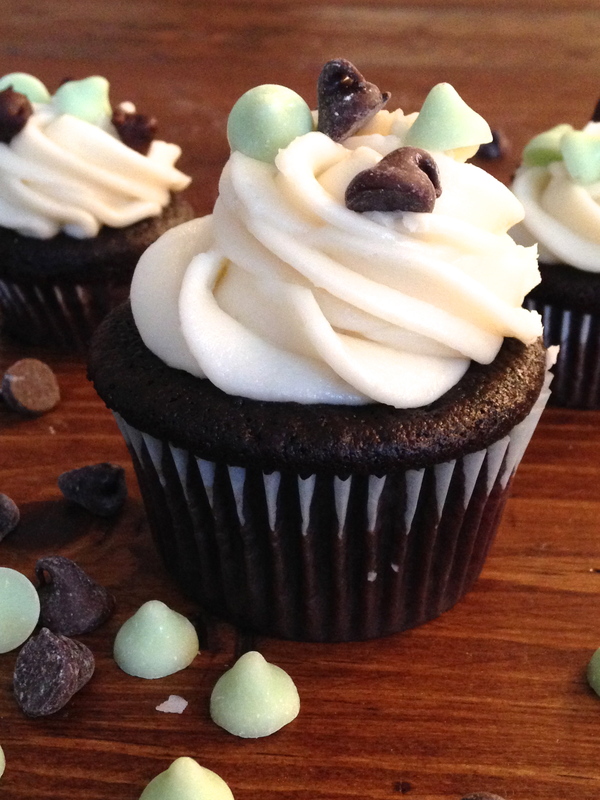 Today I am so excited to finally share with you one of my favorite chocolate cupcake recipes. Being a baker it takes years of baking and testing to find the perfect cake recipe. I am a fan of a very moist cake, so when I found this chocolate cake recipe I started using it for all of my chocolate flavored cupcakes, like nutella flavored and chocolate chocolate. YUM! One of the secrets to a rich chocolate cake is adding coffee to the batter. I promise you the cupcakes DO NOT taste like coffee. Rather the coffee brings out the flavor of the chocolate and helps smooth the batter. And as for this vanilla buttercream recipe, I could seriously eat the entire bowl! Since this week is St. Patricks Day and I have a real job and can’t spend the day drinking green beer, (I had a green smoothie instead, so not the same) I decided to make cupcakes for my husband and I. 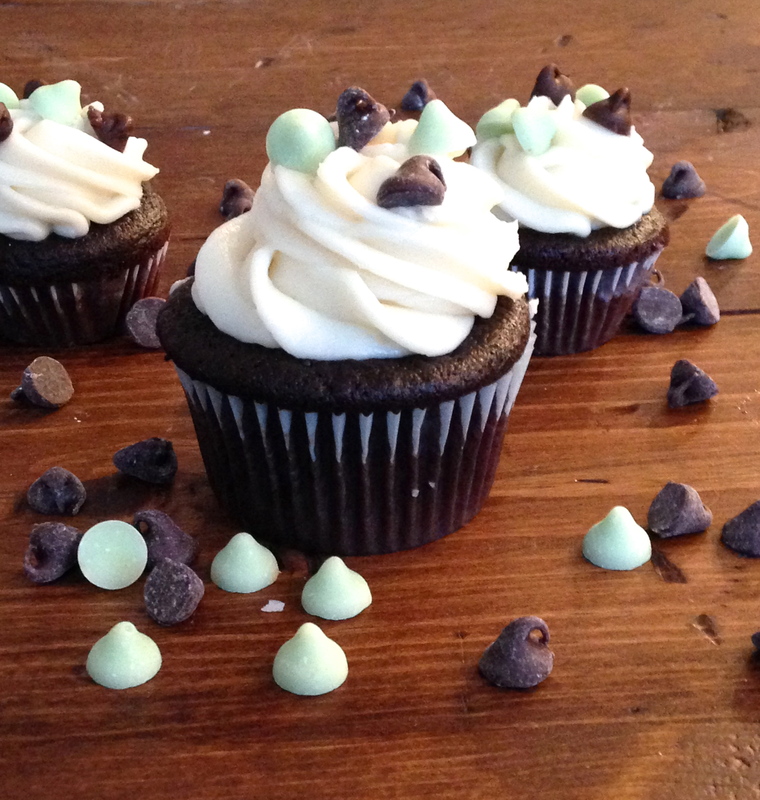 He is not the biggest mint fan, so rather than flavoring the cupcakes or frosting a mint flavor, I just added some mint-dark chocolate chips I had leftover from Christmas baking on top of the frosting. This gave them the perfect amount of mint flavor. Enjoy! Moist Chocolate Cupcakes with Vanilla Buttercream. For the Cupcakes: Preheat oven to 350 degrees and line two 12 cup muffin tins with paper liners and set aside. In a large bowl stir together the flour, cocoa powder, baking soda, and salt. Set aside. In a large bowl or standing mixer add the melted butter, sugar, eggs, and vanilla then mix together until smooth. Pour half the dry ingredients into the wet ingredients and half of the buttermilk. Stir until just combined then add the remaining dry ingredients and buttermilk then mix until combined. Stir in hot coffee with a spatula. 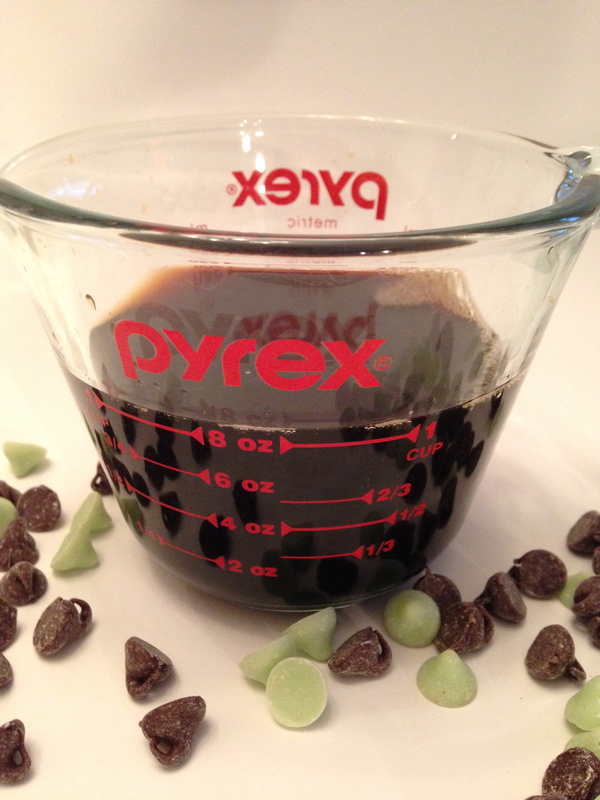 Remove bowl from mixer and add about three level tablespoons of batter to the prepared muffin cups. Bake 18-24 minutes (9-12 minutes if using a mini-muffin pan) or until you can insert a toothpick into the cupcakes and remove with no batter left on the toothpick. Transfer the cupcakes to wire racks and allow to cool completely (a few hours) before frosting. For the Vanilla Buttercream: Let the butter sit out and soften about 15-20 minutes. Then with a handheld or stand mixer beat the butter until creamy. Add the confectioners sugar, heavy cream, and vanilla and beat for 3 minutes. Add more powdered sugar if the frosting is too thin or cream if the frosting is too thick. Add a pinch of salt if desired to level out the sweetness. I used a Wilton 1M tip to frost the cupcakes pictured. Decorate with sprinkles, chocolate chips, or nuts, if desired. Secret to rich chocolate cupcakes is adding coffee to bring out the chocolate flavor!